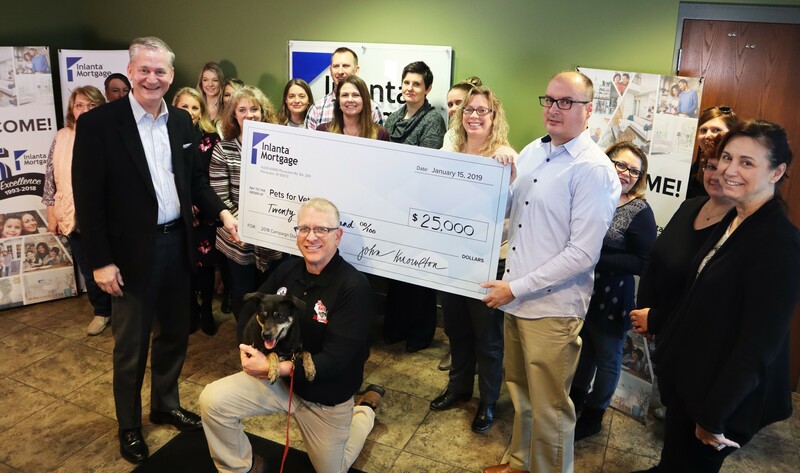 Inlanta Mortgage Inc. announced its 2018 charity partnership with Pets for Vets earned $25,000 for the charity that helps pair rescue dogs with at-risk returning veterans. As part of its 25th anniversary celebration that kicked off in September, Inlanta selected Pets for Vets as the beneficiary of its annual charity partnership. In June, Inlanta announced that it would make a donation for every loan closed through the end of the year. In addition, the company held various employee fundraisers both in the home office and branch offices, including its annual charity raffle held during its National Conference in September. The proceeds from the campaign were presented to Dan Zealley, Executive Director for the Milwaukee, Wis., area chapter of Pets for Vets. "The donation from Inlanta Mortgage and its customers will go a long way to helping both veterans and shelter dogs to get a second chance,” said Zealley. “These companion animals assist in the healing our service members. Thank you to all of our veterans!"